Shy young Victor Van Dort (voice of Johnny Depp) is being forced by his parents into a marriage to wealthy Victoria Everglot (Emily Watson). Both the bride a grooms parents have their own reasons for wanting their offspring married off, and want everything to go perfectly. Unfortunately, the night before the wedding Victor finds himself accidentally married to a dead woman, the Corpse Bride (Helena Bonham Carter). Needless to say the wedding does not go to plan as the land of the living and the land of the dead clash over who is married to whom. The Corpse Bride brings Tim Burton’s distinct visual style to life, as he did with his first stop motion feature The Nightmare Before Christmas. Whilst the plot may be rather simple it is pulled off with great aplomb, and an at times black sense of humour – typical Burton. It is a stunning film to watch, the stop motion animation is quite breathtaking in parts – particularly in the film’s final moments. The world of the Dead is full of light and colour, a strangeness brought to life as only Burton can. Indeed the world of the living is a rather drab affair, with a subdued colour palette; you would forgive Victor if he decided to stay married to his dead bride just to escape it! Johnny Depp is great as the shy Victor, and Helena Bonham Carter is engaging as the poor tortured Corpse Bride, looking for love and perhaps never finding it. The two are backed up by a great assortment of side characters including the Bride’s maggot (Enn Reitel), General Bonesapart (Deep Roy) and the villain of the piece Barkus Bittern (Richard E. Grant). Whilst The Corpse Bride boasts a talented cast it is a pity that the song and dance numbers often fall flat (Victor’s introduction to the world of the Dead a notable exception); the film would have been fine without them, albeit shorter. 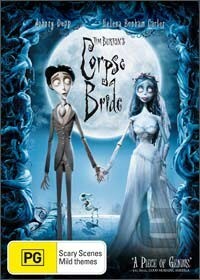 While it may not be a standout as a musical, as a film The Corpse Bride is a fun, off kilter romp that kids of all ages will enjoy.